Saints: Tuala; Pisi, Horne, Stephenson, Foden; Mallinder, Groom; Ma'afu, Hartley (c), Brookes; Ratuniyarawa, Day; Lawes, Wood, Harrison. Replacements: Haywood, van Wyk, Ford-Robinson, Paterson, Eadie, Reinach, Grayson, Tuitavake. Clermont Auvergne: Toeava; Abendanon, Betham, Lamerat, Grosso; McAlister, Parra (c); Falgoux, Kayser, Slimani; van der Merwe, Vahaamahina; Chouly, Lapandry, Lee. Replacements: Beheragaray, Chaume, Zirakashvili, Jedrasiak, Iturria, Trussardi, Spedding, Kolelishvili. Tom's preview: Saints now have the pick of two paths. One will lead them back to where they were a couple of weeks ago. The other will carry them forward into a much brighter spell. And decision time comes against Clermont Auvergne on Saturday evening. If Saints can show the same commitment and belief they did during last weekend's courageous 22-19 win against Gloucester, they can at least push Clermont close. If they don't, they could be in for another hiding, of the sort they sampled regularly between early October and the end of 2017. All the confidence they claimed from the win against the Cherry and Whites could evaporate. 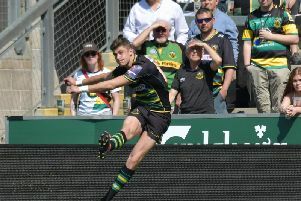 And that is why Saints are so keen to put their best foot forward against the Frenchmen at Franklin's Gardens on Saturday evening. Some may give the green, black and gold no chance against the runaway leaders of Champions Cup Pool 2. After all, Saints appear to have nothing to play for, having lost their opening four matches in the competition, claiming just one point in the process. But Clermont have been beset by injuries of late and they travel to Northampton with a squad that still contains quality but nowhere near as much as it might do. The opens the door slightly for Saints, who will look to inflict a fourth successive defeat on the French giants. But if the green, black and gold are to walk through that door, they will have to be at their best. They will have to do the basics far better than they did last weekend, while carrying the same self-belief and bravery. It is undoubtedly a big ask. But Saints simply have to choose the right path. They must maintain some momentum in the next four weeks ahead of the Premiership trip to Bath on February 9. That may seem a long way from now, but it will soon creep up, especially if Saints, who had lost 12 of their past 13 matches prior to last weekend, start to suffer again. They looked to have risen from their rut by beating Gloucester. And now it is time for them to show they don't plan to return to that old losing routine any time soon.